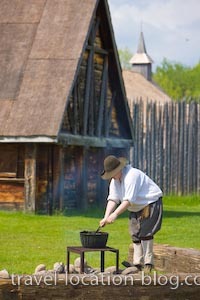 Picture of a costumed interpreter tending a pot over a fire in the Native Area of Sainte-Marie Among the Hurons in Midland, Ontario. Among the Hurons in Midland. Sainte-Marie among the Hurons is the re-created headquarters of a French Jesuit mission which is laid out as it would have been in the 17th Century. Costumed interpreters stroll the complex and are on hand to answer any questions about all facets of life at the mission. The Jesuits occupied the ancestral homeland of the Wendat Nation and to whom they ministered Catholicism to.